As a kid, we would often go on long car trips to the likes of Canada, Virginia, and California. Responsible parents would check the health of the car before heading out on a long journey. Oil, tires, flashlights with batteries in the glovebox, and if something wasn't quite right, they'd check it out. 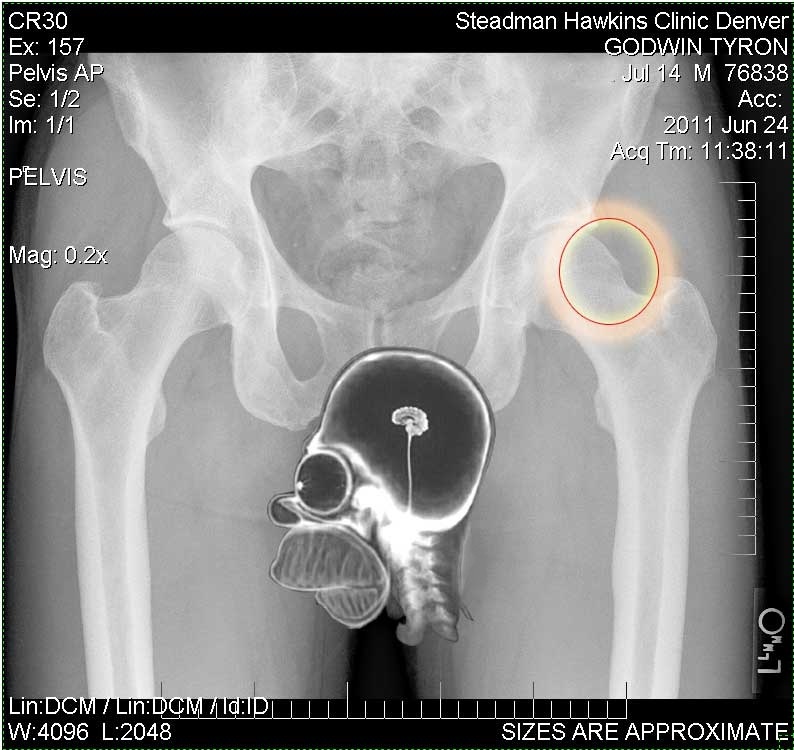 Last Friday, I went to the infamous Steadman Hawkins clinic in Denver to get my hip checked out prior to my long journey-- preparing for my next marathon. My worst fear was that there was something more serious that would sideline me before I'd even started my sixteen week training plan for the Colorado Marathon in May. Specifically, my paranoia was "had too many miles and marathons finally wore out my arthritic hips" or god forbid, "was there another stress fracture?" 1) After telling the Dr. that I was diagnosed with Ankylosing Spondylitis (AS--a form of arthritis) when I was 13, he (himself a sufferer of the same) doubted the diagnosis. He had that, "how the hell can you run marathons if you have arthritis" look on his face. More on that later. 2) I have a Femoral Acetabular Impingment. Fancy words for the ball of the femur rubs abnormally against the labrum and socket or doesn't have full range of motion. If you focus on the red circle (pain point) on my x-ray, you'll see that there's an excess of bone on the femoral head--it rubs against the labrum--thus the pain. There's a classic joke when the guy goes into the Dr. and says "it hurts when I do this," and the Dr. replies, "well don't do that." in other words, stop running if it hurts to run. I went to Steadman because they focus on athletes to get them back in the game so giving up running is not in my vocabulary. My game plan is to continue doing the things I'm doing to manage the pain and continue with training which was great news. Should the pain increase, we'd have to dig deeper with an MRI. Treatment (depending on MRI results) could be to continue what I'm doing (PT, ice, heat, massage,) injections, or surgery should there be a labrum tear. The irony in all of this is I've been walking around for years telling myself, I have arthritis. As a 13 yr old, I knew something was wrong when I had hip pain so bad, I came in last in the P.E. class run around the athletic field. Was it psychosomatic, was my Mom inflicting Munchausen syndrome by proxy? No and no. Pain is pain. I already had the trifecta of glasses, braces and zits as a 13 yr old. 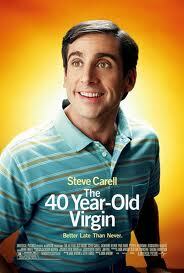 An arthritis diagnosis would make it a quadfecta and all but guaranteeing my trajectory as a "40 Year Old Virgin." Imagine the confidence I would have had it were only a redhead dealing with glasses, braces, and zits. Nah...I still would have been a nerd. I digress (again...) hips just don't fail me for the next 16 weeks. Prodding the Dr. on the potential misdiagnosis, I asked how do I know for sure. In the 90's, I had the same reaction from a Dr. based on my mobility but after xrays, he indeed saw fusing of my SI joints concluding I indeed had AS. What to do now? I'll focus on the last guy who said I didn't have it. Author's Footnote: You're probably wondering about the Homer graphic over my xray. Let's just say that my blog readership among women would have either gone way up or way down with the original version, but my Mom and her friends read this stuff, and I need my day job. Doh! The Homer graphic is clearly explained on the xray: 'Sizes are Approximate'!!!! First off, the homer cover up was brilliant! Second, I really hope you can figure out what is going on and an alternative to not running as the diagnosis. Thanks Morgan. Overall tone from Steadman was continue the training and only if pain increases, do we (ahem) dig deeper, so I'm viewing it as "all systems go!" I agree with Morgan! Don't let the A.S. get you down. I won't! Stay limber. I hope to race with you some day Ty!